I wouldn’t call this a tell-all. It is, at most, a tell-some. 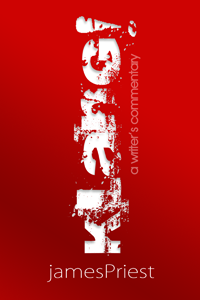 Beginning with Fabian Nicieza’s call to develop “some­thing like Power Man and Iron Fist” for his new venture, a comics line for the video game company Acclaim, KLANG! A Writer’s Commentary is mostly my usual whining and gassing on about the good and the bad of the comic book creative process. The mini-memoir includes the six unpublished “lost” scripts to Quantum & Woody #22-27 (the last issue published was issue #21) as well as the unpublished versions of early drafts from Q2: The Return of Quantum & Woody, along with about 40 or so pages of me bitching and complaining and biting the hand that fed me. Or, at least, gnawing on it a little. This started out as just another website rant. I’ve been meaning to update my post, here, about the Q2 project for quite some time, but I honestly did not know what to say. I certainly didn’t (and still don't) want to negatively impact sales. The creative development on the project was pretty tough for me—and, possibly, exclusively me. At the end of the day, the project seemed to be well-received, and, so far as I am aware, I’m the only guy whose glass remains half-full. In short strokes: there were creative differences that made for rough sledding during the development process. Early into the drawing phase, I checked out, requesting to be removed from the art review distro because I was driving myself crazy. My experience with Quantum & Woody has been amazing; I mean, who knew this off-brand, niche book would find a wide audience. It was the most fun I’ve had in this business, and Doc was a big reason for that. I don’t provide any insight into why our dynamic failed so spectacularly during Q2 because I honestly don’t know. As a Christian, I commit myself to seeing the good in people. Also, I believe that, for every disagreement or “falling out,” there is at least one piece of missing information one party or the other does not know. In 2013, a new entity, Valiant Entertainment, launched a reimagined Quantum & Woody which, to my abject horror, focused mainly on the humor while jettisoning most (but not all) of the concept’s dramatic underpinning. This was, for me, the realization of my worst nightmare: people not only missing the point of our concept but moving the series execution from satire to farce (the difference being the first four and last five seasons of Seinfeld). Much like those last five seasons of Seinfeld, the new Valiant’s Q&W outperformed the series that inspired it, winning awards and becoming a major tentpole of the new Valiant universe. But this is not what Doc and I were doing. Which is not intended as a criticism of James Asmus and Tom Fowler’s brilliant work, but more as an observation: our book took place within the normal conceits of Acclaim’s superhero universe. What made our book funny was, essentially, Woody pointing out the absurdities of the genre. At no point did Doc and I ever confer and struggle to come up with something funny; the funny just came out of what we were doing, and Q&W had as many dramatic and poignant moments as silly ones. Obviously, Valiant’s success is ultimately our success, and I congratulate Asmus & Fowler for their hit, but it is clearly and appropriately more their vision than ours. There were long, long, agonizing nights of pacing the floor, scribbling on legal pads, harassing friends, researching, giving up, hitting myself with saucepans. I wanted the book to be different enough from Valiant’s highly successful revamp but not compete with that book, which just splits the audience rather than unites it. Almost immediately, I thought of bailing; this was just too hard. My paramount concern was Mark, whose voice I’d hear every step of the way saying, “Jim, that’s just stupid,” his common refrain from our days at Acclaim. I wanted to write something he’d be happy with and be excited about. I didn’t actually expect Doc to actually like anything, I just hoped to produce something he might hate less. Attempting to hit all of those marks—a good book for Valiant that did not directly compete with their own Quantum & Woody monthly, a script that Doc would like (or at least tolerate), and something that would be a fun read for the fans—just drove me insane. It was a month of hell before pages started to come together. Life Imitating Art Marvel editor Ruben Diaz literally joined the cast during The Apocrypha (the unpublished Acclaim issues), brought to life in litigious detail by Oscar Jimenez. So, now I’ve got six issues of toothpaste I’ve got to squeeze back into a five-issue tube. I’ve got an artist who was routinely going Sarah Palin Rogue whenever he wanted, and I had a colorist who obviously did not have or had not read the script but was likely (I’m guessing) coloring “blind;” like an airline pilot flying on instruments through thick fog. I had a dense and complex plot that was being made unreadable because the pictures were fighting the words, and I had to cut thirty pages while key people in the creative process were simply not following the script or talking to me but freelancing their own creative choices all over the place. 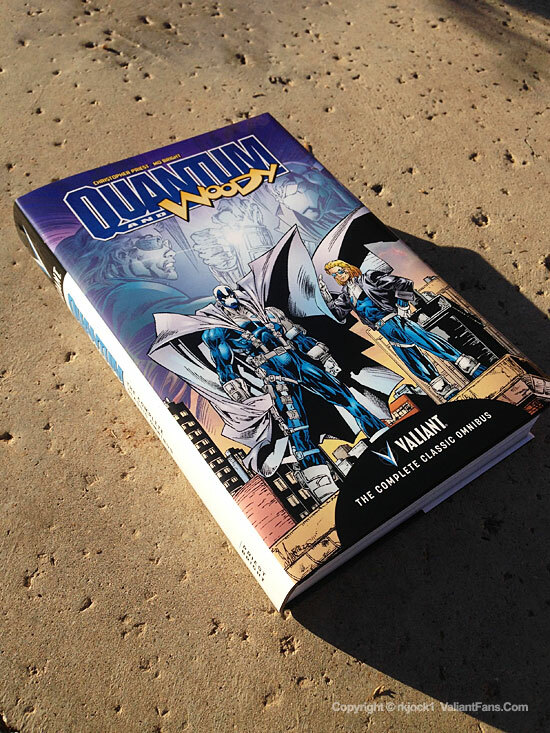 This was roughly a third of the way through the development for Q2: The Return of Quantum & Woody. From my chair, Doc and I did not distinguish ourselves as well as we might have on the project, which only made Asmus and Fowler’s update seem that much more credible and we ourselves seem that much more out of touch. Rather than open doors for both Classic Q&W and Classic Priest & Bright, Q2 likely closed—and tightly bolted—most of them. Not because the book was bad, but because the book wasn’t nearly as good as we wanted it to be. At the end of the day, Q2: The Return of Quantum & Woody is a fun, if uneven, read. It’s just not exactly the story I had in mind. Much of that is my own fault for trying to stuff a 25-pound chicken into a 10-pound bag. It’s entirely possible that I am the crazy one and that whatever hiccups occurred along the way were entirely if not exclusively my fault. I wrote nearly seven issues of a five-issue series, and important flags in my scripts could have been, well, flaggier. The point of this…this…whatever this is, is to present some of the Q2 outtakes within the context of the published script in order to present a better idea of the story I was trying to tell. As blame is being handed out, I myself bear a huge portion of it for stuff I could have done better. As for the rest, I don’t actually know what happened or specifically why the collaborative process broke down or why two grown men (or, at least, Doc and myself) could not seem to work out our creative differences. It’s entirely possible everybody gave their best effort and, in the end, produced a fun and entertaining graphic novel in spite of the twists in the road. So this is more like a cautionary tale of how the best intentions can and often do go astray. Click here to purchase. In 1987 Doc and I flew to Ontario to promote Spider-Man vs. Wolverine #1, transferring at Ottawa from a commercial airliner to a small Buddy Holly turboprop with maybe thirty or so seats tightly crammed together. Even though the plane was near empty, Doc and I sat right next to each other. And fought over the armrest.